“88%,” Alain says. “Can you imagine it, from one year to the next?” You are still doing the same job, working just as hard, but your income drops by 88%!” The Agriculture Ministry has just released the official figures for the département of the Aude. In 2008 net income was only 12% of 2007’s. Veronica and I have been invited to lunch at a shepherd’s hut on the slopes of the mountain which overlooks our Corbières village. We are looking down at the vineyards in the valley. 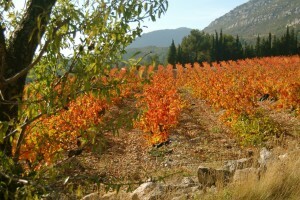 The weather has suddenly turned cold and the vines have put on their autumn coats. The leaves are a natural histogram of the blend of grapes which go to make up our wine: 50% Carignan, down by the river, 20% grenache, around the village, and 30% Syrah on the hill slope. But this year, like the leaves, the wine is dying. The trade price for red wine is now a mere 0.50 euros/litre. One quarter of co-operative wineries can’t pay their members, even though the harvests are paid two years in arrears. The government does nothing. It’s a structural problem, claims Paris. If it was just a bad harvest, just one year, they would intervene. But the problem has been going on for 10 years. The message is that we haven’t done enough to help ourselves. The message is that we need to improve the quality of the wine, and sell less of it so that prices will rise. And yet, and yet… Over the last 30 years Corbières wine has changed out of all recognition. In 1985 it became an AOC, imposing stricter standards, and improved grape varieties. Then overproduction was said to be a problem, so the poorer quality vineyards were ripped up: this year’s harvest was the lowest ever. And in the last ten years vine growers have invested massively in harvesting machines and adapting vineyards to suit, reducing costs in the long term but crippling finances here and now. It hasn’t worked. The technicians’ latest suggestion is improved marketing. Philippe Vergnes, head of the wine-makers association suggests that supermarkets could make more of an effort: they take two-thirds of the selling price of each bottle of wine. 88%. You might as well hang up the secateurs. Unemployment benefit is vastly superior. A demonstration is planned for 25 November. “Ça va péter – it’s going to explode,” predicts one of the guests. 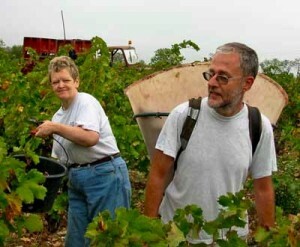 I’m glad that we don’t depend on our small vineyard for our main income. Alain points out the hills on the other side of the valley. Cool, wine-bottle green, they are covered in Aleppo pines, framing the blazing colours of the valley floor. Beautiful. “Was it planted by the ONF (the French Forestry Commission)?” I ask. This entry was posted on Sunday, November 1st, 2009 at 12:40 pm	and is filed under Uncategorized. You can follow any responses to this entry through the RSS 2.0 feed. You can leave a comment below, or trackback from your own site.